CUSA’s visiting fellow, Dr. Vandana Asthana, has authored a publication entitled, Water Security in India: Hope, Despair, and the Challenges of Human Development. Asthana’s work is co-authored by her research colleague, A. C. Shukla, and also features a foreward by CUSA’s own Director, Dr. Richard Matthew. The publication addresses and analyzes the challenges that contemporary India faces if it is to create a water-secure world, and providing a hopeful, though guarded, road-map to a future in which India’s life-giving and life-sustaining fresh water resources are safe, clean, plentiful, and available to all, secured for the people in a peaceful and ecologically sustainable manner. 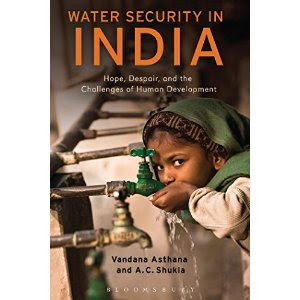 To learn more or purchase the book, please view Water Security in India’s complete details. To learn more about Dr. Asthana and her research, please refer to our earlier article documenting her visit to UCI. Asthana, Vandana, and A. C. Shukla. Water Security in India Hope, Despair, and the Challenges of Human Development. New York: Bloomsbury, 2014. Print.